The USB 1x adapter is horizontal versus vertical. Please check the pictures for more details. 2. The cables inside are specially made. Please do not replace them with other cables. 4. 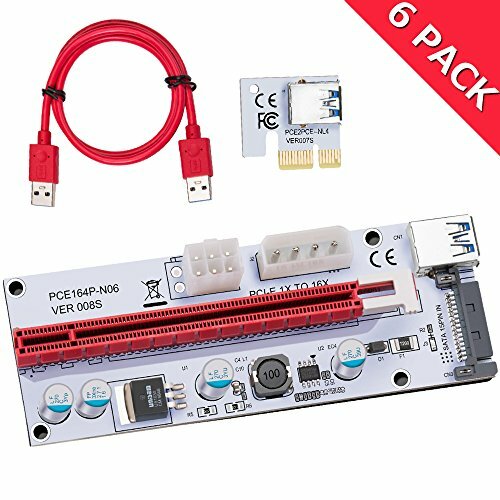 Use old flat cable for Dual core graphics card and 16X motherboard. 6. Please contact us if you have any issue with the product. 1. 4 Solid Capacitors on each card. 2. 60cm USB 3.0 riser cable. 3. 4PIN, SATA and Graphic card 6PIN interface, three interface optional. 6. 4 Holes on the riser card to fasten. 7. LED indicator and fuse are used on the board. Warning: Buy from SunTechology. Other sellers are selling knockoff products. Only SunTechology provides quality products and after sale service. STABLE CABLE: 60cm USB 3.0 cable, very soft and easy to place and route. Cable with shield net inside is more stable for mining. PCI-E 1x to 16x powered riser adapter card with multi-layer shielded wire will not weaken the signal within 3 meters.Attention: The USB 1X adapter is horizontal versus vertical. The mounting holes are located differently from other risers since there are three power options on our riser. Please check the pictures for more details. If you have any questions about this product by EXPLOMOS, contact us by completing and submitting the form below. If you are looking for a specif part number, please include it with your message.